Edgar Degas is considered to be one of the finest artists to have ever existed and produced breaktaking paintings, drawings (including pastels) and sculptures. This website covers the life of this French artist in great detail, focusing on his most famous artwork, one at a time. Edgar Degas paintings fit perfectly into the art movements of Realism and Impressionism, with the artist preferring to be linked to the former. Edgar Degas played an important role within French art at a time when it was beginning to dominate Europe and was a key member of the group of painters who began the impressionist movement that has since become one of the most popular styles of painting in the world. Most Edgar Degas paintings cover two separate topics as you will see from the selection of works that are included within this website. Most famously were his frequent portraits of ballerina dancers, sometimes during class lessons and sometimes in a full show. Degas here experiments with all sorts of different outfits and poses with the ballerinas and tackled this topic in more depth than certainly any other artist has done. Edgar Degas paintings are particularly popular as reproductions for art fans across Europe and North America with people most appreciating the feminine touch within the beautiful ballerinas whilst others prefer his horse race series which offers something very different that underlines the flexibility of the painter. Those buying Degas reproductions typically choose giclee art prints that accurately match the original colour schemes, though posters and stretched canvases are also very popular. Additionally to his paintings of ballerina dancers, Degas also captured many scenes around a race course as he looked to study horse anatomy in many preparatory sketches plus also use his findings in larger, more complex scenes around several horse racing courses. There were also several intimate portraits of a woman as she has a bath and then combs her hair but the vast majority of Degas's paintings fall into the categories of ballerinas and horses. Dancers in Blue is one of the best examples of ballerina dancers within the work of Degas and you can see that painting above. Degas was interested in body shape and would experiment with different poses across each of the related paintings. Ballerinas offered extreme positions that otherwise would not be available for his work and so he would spend large amounts of time in the company of these majestic dancers, covering them in different environments. The artist features blue dancers on several occasions in his career. Edgar Degas always claimed his art to be of the realism style but many have labelled him as a pure impressionist artist and it is easy to see from the colours in his paintings that he was also heavily involved in the rise of that movement too, though later distancing himself as it's popularity grew exponentially. Many painters prefer to avoid being placed in categories that are too popular, thus taking away their individuality as artists. Four Ballerinas on the Stage again features this much loved topic of dancers and helps Degas to again show off his great ability in painting movement effectively which many other artists have struggled to do. Degas initially wanted to portray historical scenes within his career but this quickly changed as he matured and began to have a more individual approach to his career. After a career which produced so many interesting paintings Degas left a great legacy which is known to have influenced many key artists that followed on after his death. Whilst the exact level of influence is not known there is clear evidence that Degas significantly influenced the ideas and techniques used by big name artists such as Mary Cassatt, Jean-Louis Forain, Walter Sickert and Henri de Toulouse-Lautrec. Green Dancer is a beautiful painting by Degas which uses exceptionally well chosen colours that light up the work brilliantly and in such a way that it is very easy to understand why this is one of his most loved paintings amongst the art public of the present day who typically are drawn towards those artists with the best and boldest use of colour. Artists considered talented with the use of colour includes Edgar Degas alongside the likes of Marc Chagall, Paul Klee and Pablo Picasso. To add to the paintings included within this website, Degas' other notable works included The Bellelli Family, Woman with Chrysanthemums, Chanteuse de Café and At the Milliner's. The artist also had skills beyond just oil painting and was impressive within drawing and sculpture. It's unquestionably his oil paintings for which he his best remembered and respected and as much as he distanced himself from impressionism as it developed through his lifetime, that link has never diminished. Edgar Degas was one of the most skilled French artists of all time and is best remembered for his paintings, sculpture and pencil drawings which all benefited from his technical skills and creative eye. Degas himself is still one of the most reproduced artists in the western world, a century after he was born. This underlines how the qualities of his work have remained relatively timeless so that his career has not become subjected to fashionable trends, unlike certain others from around this historic period. Edgar Degas played a significant role in the development of the Impressionist movement which appeared from France in the 19th century and is one of the major artistic styles to have come from Europe, from any period. Degas himself was on the fringes of the movement and despite contributing a lot was also linked to other, more established art movements, such as Realism. In truth, the artist attempted to distance himself from the Impressionists at the time of their rise in fortune but technical studies which have followed on since have all concluded that this was the group to which his style is most closely matched. Ballet Dancers are a theme used through much of Degas' work and it is probably what draws most of his modern day fans into his career, with frequent exhibitions around Europe and North America displaying some of the best of these ballerina paintings throughout the year. The art public seems to find ballet dancers as an ideal choice for impressionist and similarly expressive artists and the consistent attention to this theme has certainly helped Degas to retain his popularity right up to the present day. Edgar Degas was born as Hilaire-Germain-Edgar De Gas but during his career his name became shortened to what we all now better now him as. The success of this artist has made him one of the most influential artists from the past few centuries and there is a long trail of creative people whose careers have followed on since, with a heavy influence of Degas to be found in much of their work. Edgar was both a skilled painter and sketcher and these two skills can appear in all manner of modern day art movements which ensured that his legacy influenced so many people around the world. 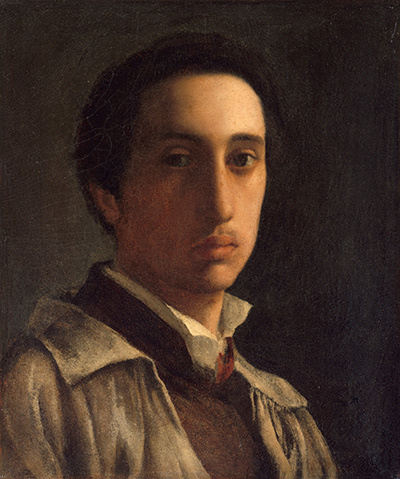 As a young, aspiring student, Degas was very fortunate in the fact that he had some family in Italy as well as France where he was living, and this situation enabled him to discover many different European artistic influences which would help him to mould and refine his own techniques and style as an artist. Italy played host to Degas for several years and this allowed him the opportunity to study Italian art which had been dominant for previous centuries and thus had much to offer him. Wikipedia is an excellent resource for all manner of topics and covers a wealth of artists and movements with in it's ever expanding Wiki. There is good coverage of the three main themes in the artist's career, namely the horse and jockey paintings from Longchamps as well as the complex portraits and of course the French ballerinas which themselves remain the centerpiece of his whole career. French exhibitions are frequent around the world and Impressionism is seen by many as their finest export, gifting us a substantial number of household names in a relatively short period of time when set against the overall backdrop of the previous few centuries. The use of bright colour and imagination from artists were key to the success of the impressionists and Claude Monet is probably the most famous of all of them, with the likes of Edgar Degas also highly prominent. Degas always preferred a certain level of independence as is so common for artists and as the impressionists rose in popularity he was to be found distancing himself from that as much as he could, preferring to be placed more in the area of realism. Art historians have concluded that his style was a combination of both and that he should still be considered very much part of the impressionist scene from 19th century France. Degas bad a light touch in his work which explains the appropriateness of ballerinas in his work as well as the large female following that his career enjoys today. Impressionism was often a out subtlety and often concentrated on a charming landscape scene with the artist carefully reproducing it through his own eyes and adding a little of his on inspiration as he went along. Edgar Degas paintings are illustrated throughout this website and we have tried to break up the textual content with the best pictures from his career, handpicked by us to provide a quick summary of different work found across his career. You will find Edgar Degas sketches, paintings and pencil drawings along with different content such as portraits, horse races plus of course some of his many ballerinas which can be found over and over again. 19th century France can be placed among the key periods in European art and sits comfortably alongside the Italian Renaissance in providing crucial developments in the direction and ideas to be found in European art. It is also an example of what can be achieved by a group of skilled artists with a passion for a new movement which needs time to be accepted into the mainstream. The 18th century also gave us some important French painters and it was then that this country started to become a really important force in European art having previously lagged behind Italy during the Renaissance and Baroque periods. During the 18th century many new developments helped move us further towards the ideas which were to come about during the mid-19th century thanks to the likes of Claude Monet and the others mentioned elsewhere in this website. Edgar Degas was someone who originally wanted to follow a traditional style of painting which explains how he preferred to be linked to realism and impressionism, as well as explaining why his technical skills were based on relatively older ways of painting. These methods when combined with modern life which Degas was later to choose to depict in his work made this artist somewhat unique from all others around at that time, and this uniqueness made him harder to confidently pigeon hole into one specific movement. After being encouraged towards a career in Law by his family, Degas eventually came around to the idea that art was where he should be channeling his energies, as that was where he felt a passion which was to drive on the existing skills that he had already mastered by himself. Classic art training was to then push him onwards ever further and it was clear at that point that this was an artist who could achieve success with in his career once he had completed his artistic studies. Having studied in France the artist then moved to Italy for several years with the intention of studying all that come about during the Renaissance. There were countless opportunities for Degas to find inspiration here. The likes of Titian and Michelangelo all came under the focus of this artist who would select elements from their classic paintings and reproduce them himself to learn and appreciate from those who he respected most in the art world. Ballet Dancers were an excellent way for the artist to experiment with his portraiture and also include elements of movement whilst most of his other portraits were captured in a very still setting, with the viewer instead intrigued by the complex and reserved expressions of the sitting model. For the ballerinas there was a chance to be more obvious and bold, with multiple movements and shapes placed across the more detailed of these. The biggest fans of artist Degas will delve further into his career than others and go beyond just the dancers and horses which most are already aware of. There are some historic based works from earlier in his career which still exist and these make excellent study pieces for those looking to understand where Degas was at the beginning of his career and how his style changed over time as he began to put different types of content into his work. Edgar Degas viewed the impressionists as artists who would create something new, partly unplanned and driven by inspiration and creativity in their own minds. Degas felt that his work was simply taking elements of past masters and adapting them to modern day scenes which he himself would plan carefully, with little spontaneity. This led to him genuinely believing that his style diverged considerably from the impressionists but the truth is that there were clear similarities and his career will always be linked to that movement. There were several competitors to Degas during the period of his career and most were to be found in France at that time. The Impressionists was made up of predominantly French painters, with some additional contributors from America and UK who moved to France as well in order to pursue their chosen route into the art world. They were then to help spread information on this new movement across national boundaries as it became clear that this collection of artists was to later gain acceptance. The impressionists arose around the mid-19th century and achieved a huge amount during it's span over several decades, taking us up past the start of the 20th century towards the new modern art movements which came about directly as a result of these earlier artists who encouraged artists to be bold and more expressive than perhaps seen before in more traditional movements. Degas was happy during the early days to be part of the impressionist exhibitions which at that time were small scale and had an excellent level of independence as well as being fresh and mysterious to most onlookers. Degas seemed to lose interest in spending time closely linked to the other members of this group as it rose in popularity and this is common of creatives who normally put independence, academic acceptance of their work and personal satisfaction above mainstream approval. Ballerinas provide such an important role here in illustrating Degas' portraiture skills and this topic is also popular aesthetically with art fans who appreciate the feminine beauty of young ballerinas as they practice and display incredible dexterity. The followers of cultural items such as Ballet will often share a similar interest in art history as well, making the two a perfect fit for mainstream art reproductions, as shown in the popularity of the artist's work in the present day. We hope that you have enjoyed this small website, there will be plenty more added in the near future, including an expansion of the gallery to cover more of Degas' best work as well as further discussion on his life as a whole. With so many fans around the world, it may also be necessary to translate this website into further languages too to broaden the reach of the website. The very best of Degas is now stored in permanent collections of European and American national and regional galleries and museums, with France still retaining a reasonable of their artist's work. There have been frequent exhibitions of Edgar Degas in different countries which are always very well attended and this is another sign of his popularity continuing into the 21st century. French art dominated during the 19th century in the same way that Dutch and Italian artists had had their own moments during previous centuries as the best movements in Europe began to cross national boundaries and communication between artists in different regions improved greatily. French artists such as Degas were leaders in the impressionist movement which has given us so much ever since from the art it directly produced to the other movements which sprouted out from it afterwards. Degas prints are particularly popular at the moment and are ideally suited to many different homes, as the style used by this artist fits somewhere betweem traditional and contemporary art. You may find examples of his work reproduced in people's houses all across the world as impressionism has become one of the most international of artistic styles and their finest exponents are known of in most countries and cultures. Framed paintings best suit Degas' work as he was someone who style was classy and perhaps not contemporary enough to simply serve up as an unframed print on it's own, although some may still go for that instead because of it's much lower price tag. Exhibitions offer the opportunity to occasional art fans to also discover his work and such people may instead go for alternatives like stretched canvases and posters which may suit their rooms better. Those buying art reproductions tend to have a relatively small understanding of art history and as such will pick from a small pool of artists and paintings, in which Degas will often be found alongside other stalwarts like Claude Monet, Pablo Picasso and Vincent van Gogh. Those who have a better understanding are still likely to look towards Degas, though, because of the exceptional technical skills and eye for colour which he possessed. Jockeys and race horses were covered by artist Degas at the French racecourse of Longchamps. There was a whole series aimed at capturing the excitement of horse racing as well as the intimate relationship between horse and rider with Degas able to capture this in a whole host of different scenerios and from many different angles. This comprehensive study is similar to the way in which the painter tackled ballerinas in another period of his career. You will see throughout the gallery here that we are talking about an artist who loved the composition of portrtait and each new idea served as a further way to experiment with the human body, which he completed in all manner of ways. Dancers offered interesting angles as well as a great selection of colour which also connected well to his impressionist values. The gallery included here is just a small snapshot of some of the highlights from the career of this talented French painter who used elements of impressionism and realism with in his work. Those looking to see more Degas paintings should click on the links available with in this website which will take you through to another website which offers far more visual information on his work with galleries covering every major painting and drawing from his distinguished career.